Head of Early Childhood Kim Barnes write about a community service project pairing third graders, kindergarteners, and pre-kindergarteners to make blankets together. “They are so cute” were the words from the third grade student as he worked with a group of four pre-kindergartners and three other third graders. They, like the other 76 third graders, 24 pre-kindergarteners and 64 kindergarteners, had gathered together to do important work and this particular third grader seemed to be delighted to work with younger students. 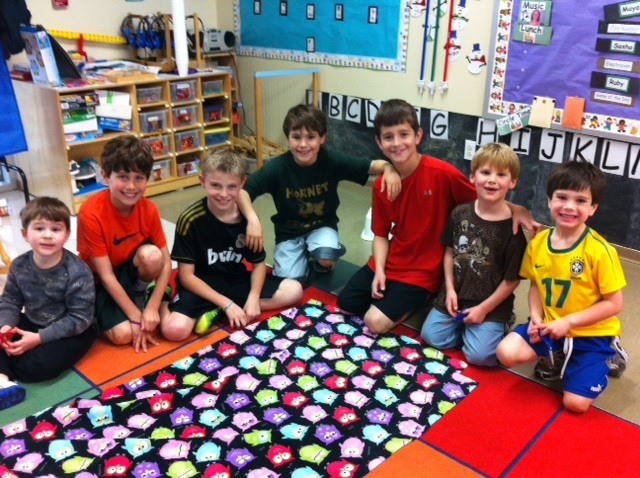 Their work was to make fleece blankets to give to the children at The Vogel Alcove. The third graders had been prepped with the directions, but even after several reassurances, the third graders still worried the younger students were going to cut their fingers as they cut the fleece edges into strands. Patience was, indeed, the term for the activity. The requirements of this activity were fully integrated. Each group worked on verbal cooperation to come to agreement on a one-strand or two-strand knot. They used a standard measure square guideline of three-inches for the length of each cut and a non-standard unit of measure of a third grader’s finger for the width of each strand. 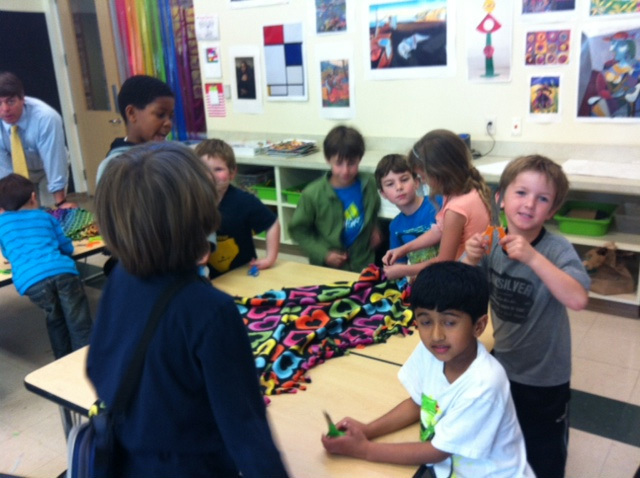 The physical aspect of this activity required the third graders to learn and teach how to tie the chosen knot. This was not easy for many and took several practice attempts before some had mastered the skill. Of course, the scissors weren’t always the sharpest; hence, problem solving and sharing ensued as both the third graders and pre-k’ers and kindergartners came up with a system to use the scissors, which had proved most successful to cut the fabric. There were a few tears shed, but perseverance won out at the end of each of these collaborations. The children began with the same size and the same prepped piece of fabric. When finished, like the students who were creating these bits of warmth, the pieces were no longer the same. Some of the knots were a little tight and the strands, a bit uneven. And on a couple of blankets, a bit of length had been removed; there were also differences within each blanket as each pair of third grader and preschooler worked on their side. The final product, however, was the same in that each blanket was endearing and could be imagined wrapped around a tiny body. Children were dedicated to their work of purpose to fruition. As the third graders returned to class, the words “they are so cute” were heard once again, but this time, the reference had a bit of pride as they paraded past their work.